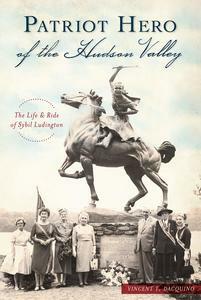 Author Vincent Dacquino will present a talk on his latest book, Patriot Hero of the Hudson Valley: the Life and Ride of Sybil Ludington, at the Garden House at Keeler Tavern Museum & History Center on Sunday, April 7, at 2:00 p.m. Admission is free, with a suggested donation of $10. Advanced registration is requested at www.keelertavernmuseum.org/events. A reception and book signing will follow the talk. Sybil Ludington was 16 years old when a messenger arrived at the Dutchess County home of her father, Col. Henry Ludington, bringing the news that the British were heading to Danbury to capture Army supplies hidden there. Col. Ludington's militia was called to help defend Danbury. There being no one else available, Sybil made a rainy midnight ride through nearly 40 miles of back-country roads to muster her father's men. The militia reached Ridgefield in time to participate in the battle the following morning, April 27,1777. In Patriot Hero of the Hudson Valley, Mr. Dacquino uses Ludington family documents and correspondence to tell Sybil's incredible life and legacy beyond her midnight ride. Vincent Dacquino is the author of several books for young children, including the popular young adult novel Kiss the Candy Days Good-Bye. He is the founder of the Peanut Butter and Jelly Writing Academy and has made numerous appearances at schools and historical sites based on his adult biography, Sybil Ludington: The Call to Arms. A "classroom-ready version" of this book for fourth and fifth grade students was released in May 2008. The book includes exercises in DBQ's and is published by Purple Mountain Press. Mr. Dacquino was a teacher in Westchester County for over 30 years. He retired from public school teaching in 2007 to dedicate more time to his writing, lecturing, workshops, and TV talk show, "Let's Talk Writing." He resides with his wife, June, in Mahopac, NY. Keeler Tavern Museum & History Center presents three centuries of the town’s history through the lives of the families that occupied the site starting in 1713. It offers docent-led tours of its period-furnished building February through December (Wednesday, Saturday, and Sunday, 1:00–4:00 p.m.) More information may be found at www.keelertavernmuseum.org and at Facebook.com/KeelerTavernMuseum, or by calling the office at 203-438-5485. Keeler Tavern Museum & History Center is located at 132 Main Street, Ridgefield, CT.
Photo Caption: Author Vincent Dacquino will present a talk about his latest book Patriot Hero of the Hudson Valley, at Keeler Tavern Museum & History Center on Sunday, April 7, 2019 at 2 PM.